A Big Thank You to Talent LMS! Beverly Kaye and Julie Winkle Giulioni get right down to the crux of the matter: conversations. Often, in the quest to retain employees and boost productivity, companies create complex systems. Kaye and Giulioni simplify it. 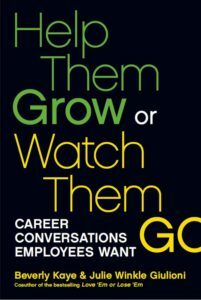 Filled with practical tips, guidelines, and nearly a hundred questions to use in your conversations, this little book will change the way you think about career development in your organization.